Summer may be over, but you don’t have to stop enjoying ice cream. Especially when it’s so good. I didn’t think a place like this existed anymore. A small business on a small main street with killer quality food and dirt cheap prices. 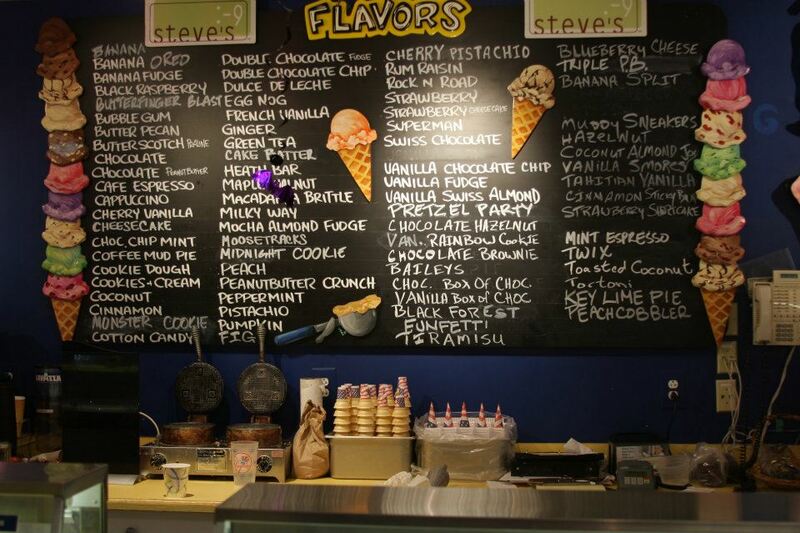 In a world where ice cream is all of a sudden priced as if it were frozen liquid gold, What’s the Scoop in Metuchen delivers with something refreshing and won’t burn your wallet. Though it is indeed a modern location, the atmosphere is one of nostalgia, and the prices certainly reflect that notion. It was not too long ago when on our trip to New Hope walked in—and quickly out of— a homemade ice cream store because the price for three scoops without any toppings was $7.95. It was the first thing on their back wall my eyes focused on. Quite an impression it left. I shudder to think what the price would have been if I wanted a drizzle of chocolate syrup on that and maybe some Reese’s Pieces. Gee, it would have been over $10. Could you imagine two people walking into an ice cream store wanting only a moderate sized sundae each and dropping a $20 bill? The thought is asinine, and the action much more. Not to go off on a tangent, but that’s what you are going to deal with in small, privately owned ice cream stores, except with, apparently, What’s the Scoop. Picture borrowed from their Facebook page. It is a few years old and some flavors have changed slightly. In their large sundae (you can choose from more than 60 flavors of ice cream) you get two heaping scoops, two wet toppings, one dry, whipped cream, and a cherry, all for just $5.95. I dare you to finish the whole thing, because it ends up being a tall order and much larger than it seems. Flavors are creative, with kinds such as chocolate pretzel and rainbow cookie (my most recent sampling), and more exotic like green tea. All I tried were delicious. Available toppings are an array of sundae standards. I could go on and on, but I would rather you just take my word for it and go taste for yourself. The product is creamy and fresh, and the chunks of whatever was added when they made it are large and plentiful enough that it makes a difference. Also, I have to mention that this place sells their own pizza. It might be an odd feature, but its actually a match made in calorie heaven. I only had it once, but it was pretty damn good. It won’t blow you away, but for $1.50, it was excellent. The crust is thin and well-cooked all around. The pizza counter is first when you walk in, so you are hit with a blast of cooking pizza, before you move down the line and get to where the ice cream is. You might as well make the afternoon of it and do both. There aren’t many places where you can get two quality slices of pizza and a large sundae and not hit $10. The inside is spacious with plenty of seating, and there are also outside tables if the weather is nice. This is a must-try. 4 out of 5 stars (review #14). What’s the Scoop? is located at 410 Main Street in Metuchen, New Jersey.